Made by Alessi in Italy, Europe, 1990s. The ‘Juicy Salif’ lemon squeezer was a classic of postmodern product design of the 1990s. Designed by the internationally renowned French designer Philippe Starck for the Italian firm Alessi as part of the 1986 Project Solferino (a collaborative project between Alessi and Francois Burkhardt from the Centre de Creation Industrielle at the Beabourg in Paris), the ‘Juicy Salif’ was among the first of Philippe Starck’s designs for Alessi, along with a kettle, wall clock and colander. Lemon squeezer 'Juicy Salif' and packaging, stainless steel / cardboard, designed by Philippe Starck, made by Alessi, France/ Italy, 1990s. 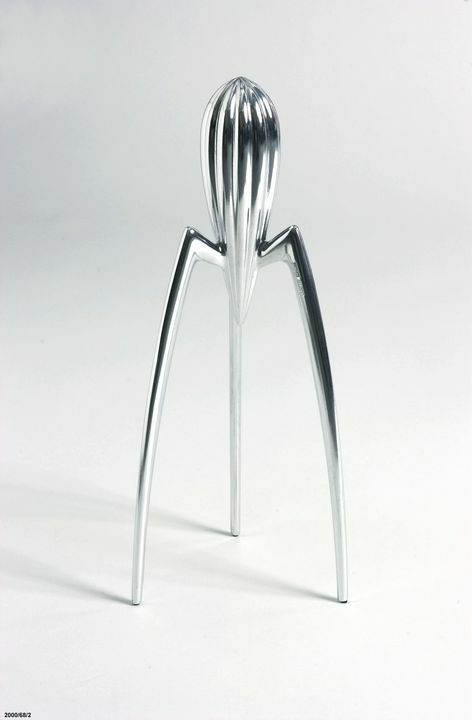 A metal lemon squeezer in the form of an inverted, elongated drop moulded with regular vertical grooves (forming a waving pattern) and standing on three, very tall, spider-like legs extending from the base. The 'Juicy Salif' lemon squeezer was designed by Philippe Starck in France and manufactured by Alessi in Crusinallo, Italy in the 1990s.